I feel badly for Phil Kessel. Brian Burke paid a hefty price to bring Kessel to town, giving up a 1st and 2nd round draft pick in 2010 and another 1st round pick in 2011. The way this season is going, that 1st pick next year could easily be in the top three overall. It's a pretty high price for a player who recorded his season high for goals last year with 36. He had Marc Savard feeding him last season. This season, he'll start on a line with Matt Stajan and Jason Blake. There is no Marc Savard on this team. I hope I'm wrong, but I don't see Kessel scoring 30 for the Leafs this season. I don't see Leaf fans being patient with a guy who cost us as much as Kessel cost us. The disappointment that is Jason Blake only cost us room under the salary cap. Kessel cost us cash, a 1st and 2nd round draft pick in 2010 and another 1st round pick in 2011. I don't see this going well at all. I hated the trade right at the start. Regardless of how the Leafs finish....having a couple of first rounders is priceless. Now we have nothing for 2 years. Really bad trade. On another conspiracy note...Savard is in the final year of a contract.....hmmmmm, maybe there is a part 2 to this plan??? So will this guy likely be the Leafs new team Captain? Why else wouldn't they have designated someone during the pre-season? Mike - I can understand your frustration, but a couple of points – why would Kessel be chosen 5th overall if he didn’t have NHL caliber finish to his game. I don’t buy that Savard made him that much better. The same was said with Adam Oates and Brett Hull; didn’t Hull go onto have more 50+ goal seasons after Oates was traded from St. Louis? Secondly, I don’t believe the Leafs will finish as far back as you think; it’s a long season. So let’s say they do make the playoffs, this year and next year. Would you go to the draft and trade this years 14th and 44th pick, and next years 14th pick for the 5th player overall that is guaranteed to be a NHL player now? I bet you would, and I bet most GM’s would not trade that 5th pick. Mike – you’re folding your hand before you receive your cards. @CQ The Leafs have not had a Captain since Mats Sundin left town. I personally wouldn't think that Mr. Kessel is Captain material. not for a storied team such as the Leafs. 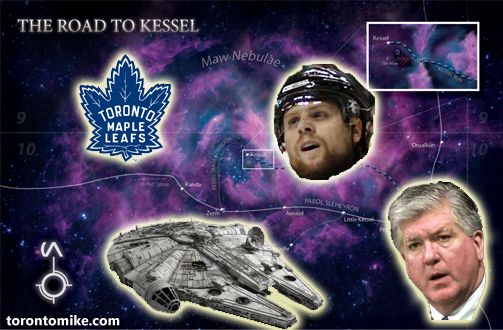 I wonder if Kessel will find Toronto to be a wretched hive of scum and villainy? I actually flip flop on this one on a regular basis. On the one hand, we have a 22-year old with a 36 goal season under his belt. Outside of Rick Vaive and Wendel Clark, that simply doesn't happen on this team. But with one win in our first dozen games, it doesn't look like it's going to be a 14th overall pick. It looks to be much higher, and there's three good draft picks in total. Would we trade Schenn and Kadri and a 2nd round pick for Kessel? Probably not. The proof will be in the pudding. The Kessel era begins tonight and I'll be watching. I've watched one game with Kessel in a Leafs jersey and I'm prepared to go on the record and say Greatest Trade of All Time! yeah, Kessel has played 5 games and has 4 goals and 2 assists. I personally think He should be the only one on the team Wilson is even considering giving the C to, but i agree that it's just giving kessel some responsibility he doesnt need, when he should focus all on his game. All in all, I'm a die-hard leafs fan, but a lot of our players are overpaid bums. What has Kommisarek done? not much, 0 points and -9, and now he's out for 3 weeks. I can't say that's a tragedy. I can't see Pony staying after this year either. Plus our starting goalie is a rookie, because our 35 year old goalie is being taught a completely different style, and it's just confused him. I would say let Toskala play how he wants to. There are tons of great goalies who aren't butterfly. And to be honest, Toskala is a backup. It's stupid to start a back-up goalie while retraining him. I can't put the blame on the poor guy. He's playing well considering the circumstance. I think Kessel is the only chance we have to keep half the fans we have this year. but that's just my opinion.